A major study published on Thursday warned of a malnutrition crisis in almost every country in the world with India holding about one-third of the world’s burden for stunting. Forty-six million children in India are stunted because of malnutrition and 25.5 million more are defined as “wasted” – meaning they do not weigh enough for their height, according to the Global Nutrition Report 2018. 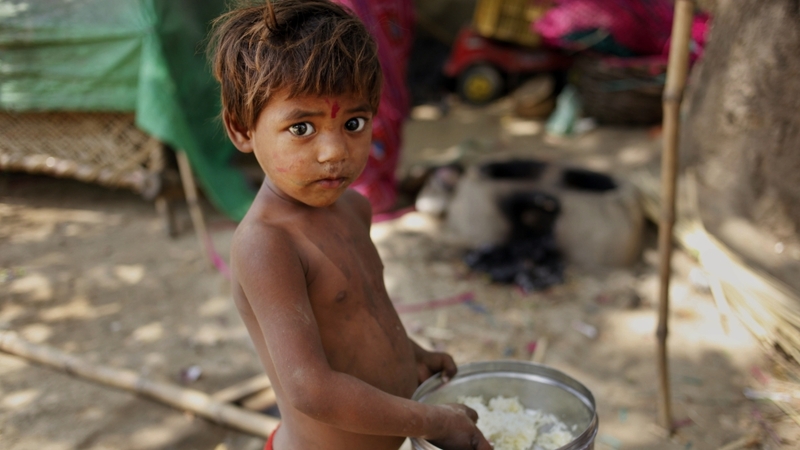 Worldwide, 150.8 million children are stunted and 50.5 million are “wasted”, the report said. “The uncomfortable question is not so much ‘why are things so bad?’ but ‘why are things not better when we know so much more than before? '” said Corinna Hawkes, co-chair of the report and director of the Centre for Food Policy. Asia is one of the hardest-hit areas when it comes to malnutrition although the region experienced the largest reduction in stunting from 2000 to 2017 – from 38 percent to 23 percent. In India, high rates of malnutrition lead to anaemia, low birth rates, and delayed development – perpetuated from generation to generation. Dr Basanta Kumar Kar – who is part of a health committee at NITI Aayog, India’s government think-tank – said stunting in children is poor growth that can cause profound damage to both body and mind. “Malnutrition is linked to mortality, morbidity, brain/cognitive development, and overall physical growth of a child. A malnourished child is vulnerable to infections and many life-threating diseases,” Kar told Al Jazeera. “The odds against these children making it to secondary school, let alone managing an intellectually or physically challenging job, is slim. Malnourishment is hence also linked to productivity,” he added. The Global Nutrition Report is an independently produced annual analysis of the state of the world’s nutrition. Apart from children’s diets, the report flagged up gender inequality, early child-bearing, open defecation, education, and economic staus as influential factors in India’s malnutrition crisis. Despite available data, progress on tacking malnutrition is “simply not good enough”, according to the report. Globally none of the countries with sufficient data are on course to meet all nine targets on malnutrition. India is not set to meet any of them, the report said. “We are conscious of the fact that a large proportion of our children are stunted and wasted. To attack this problem, we have launched a nutrition mission this year where we will be using new technology to attack this problem,” Rakesh Srivastava, from India’s Ministry of Women and Child Development, told Al Jazeera. India is the world’s fastest-growing major economy and during the last two decades has recorded economic expansion that helped lift hundreds of millions out of poverty. But it still remains a deeply stratified society with extreme inequality between its rich and poor. Nikhil Day, at Mazdoor Kisan Shakti Sangathan, a peasant and workers’ organisation in the western state of Rajasthan, expressed alarm at Thursday’s report. “It robs children of their future and countries of their humanity. This should be a national priority,” he said.